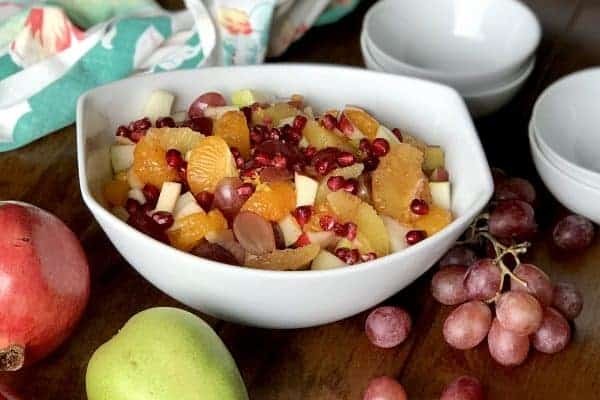 My go-to fruit salad for a weeknight meal was always the simple combination of strawberries, grapes, Mandarin oranges and pineapple. 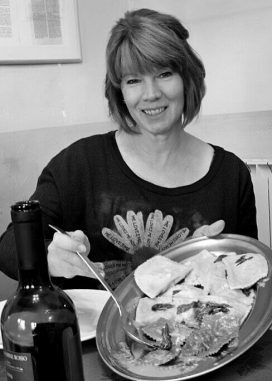 There was something about the bright colors and the combination of the tart and sweet that pleased my family. 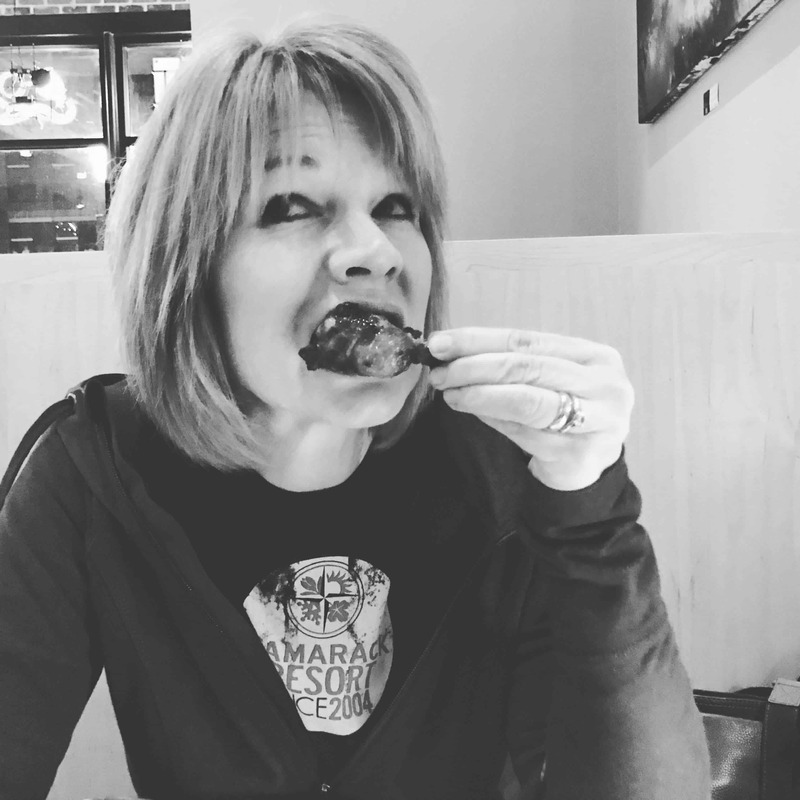 It was my secret weapon for battling the groans that would likely come when the broccoli or peas made an appearance on the table. Oftentimes, in the fall or winter, strawberries would either be of poor quality or much too expensive (or both) and my go-to fruit salad became a no-go. I needed an alternate bribe. Enter the perfectly timed arrival of one of my favorite recipe magazines. I honestly can’t tell you which one it was and I can’t even say the picture was all that inviting but the words “pomegranate syrup” caught my attention. Apples, pears, oranges, kiwi? All readily available and seasonal fruits in the fall and winter. Pomegranates? Pomegranate Juice? Pomegranate Seeds? Fresh on the health scene. Beautiful. New to me. Good enough to act as a bribe for the consumption of peas? Absolutely! Pomegranate seeds and juice are antioxidant, anti-inflammatory powerhouses. The seeds add, not only nutritional benefits to this salad, but a nice texture contrast to the fruit. 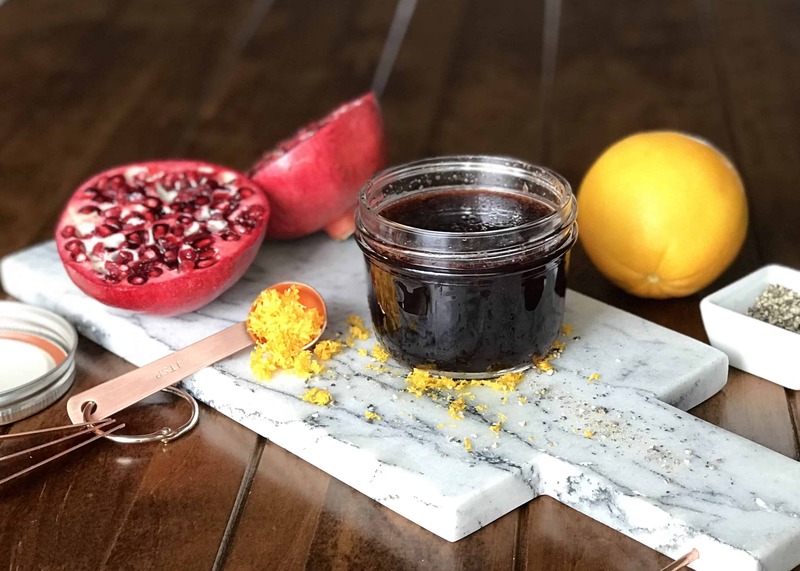 Using 100% pure pomegranate juice may be a bit more expensive than other juice options but the tartness of this juice keeps the syrup from getting too sweet. Adding a bit of orange zest and black pepper provides just the right amount of acid and warmth. Yes, black pepper sounds like a weird thing to add to a fruit salad but you have got to trust me on this one … it’s amazing! I would even go so far as to recommend that you make a double batch of this syrup. I am also working on a recipe using this syrup to glaze pork loin slices. It’s okay. You can take a minute to add 100% Pomegranate Juice to your grocery list. I’ll wait for you. And, while you’re at it … add peas and broccoli to your list. 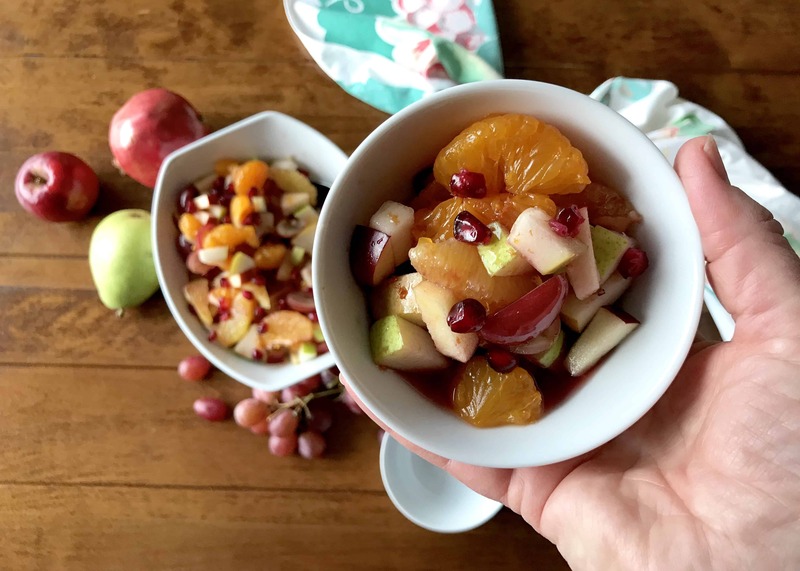 Fresh fruit salad gets a holiday makeover with a touch of a tangy pomegranate and orange syrup. This recipe is sure to be a success at any meal. 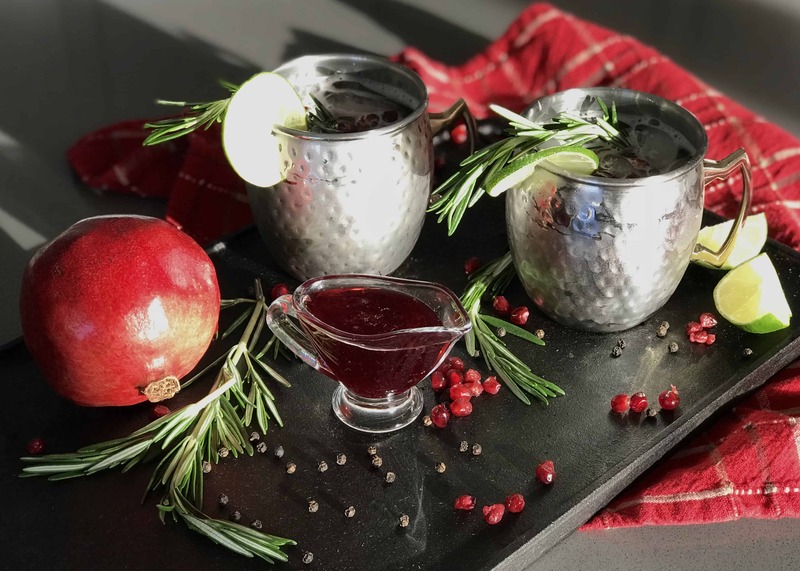 Pour pomegranate juice into a small saucepan and stir in sugar. Bring slowly to a boil over low heat, stirring constantly, until sugar dissolves (about 5 minutes). Remove from heat and add orange zest and black pepper. Cool to room temperature. Peel and section oranges. Core apple and pears and cut each into 1/2 inch slices or chunks. 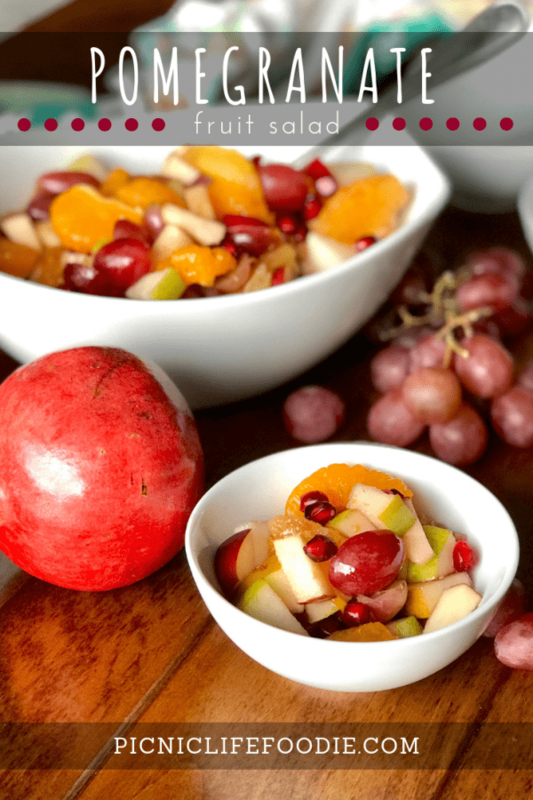 Combine oranges, apples, pears and grapes in a bowl. Pour syrup over fruit and stir gently to coat. Sprinkle pomegranate seeds on top. One 15 oz can of Mandarin oranges (drained) can be substituted for the fresh orange segments. Other fruit can be substituted or added as desired (e.g. bananas, grapefruit, kiwi, blueberries, pineapple, etc.). Previous Post Squash Soup – What? No Marshmallows?